Is your yoga mat eco-friendly and safe? Does it have alignment lines to help you improve practice? Are you tired of having to constantly replace your mats due to wear and tear or poor performance? DAWAY Y8 best yoga mat will comfort to your yoga workouts. Long enough, wide enough and thick enough. 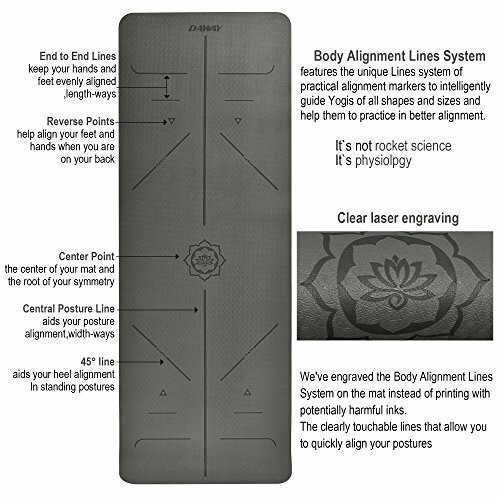 It's designed for all types of yoga and all people. Eco-friendly TPE material, with professional alignment lines, lightweight, easy to clean, easy to carry, safe to use, absolutely worth! What is TPE yoga mat? How to clean and care the TPE yoga mat? TPE yoga mats are very durable and can last you years, as long as you keep them clean and give them some care. To clean, just use cloth or towel to wipe down or wash with mild soap and water and let air dry. 1.Don't use a washing machine or dryer. ECO FRIENDLY MATERIAL, ANTI-TEAR, COMFORTABLE - the best high density TPE material with DAWAY Y8 yoga mat, nontoxic, no harmful smell, no PVC, latex and other toxic chemicals, greatly enhance the strength of tear resistance, recyclable. Soft, elastic, better protect your joints without affecting body's balance. 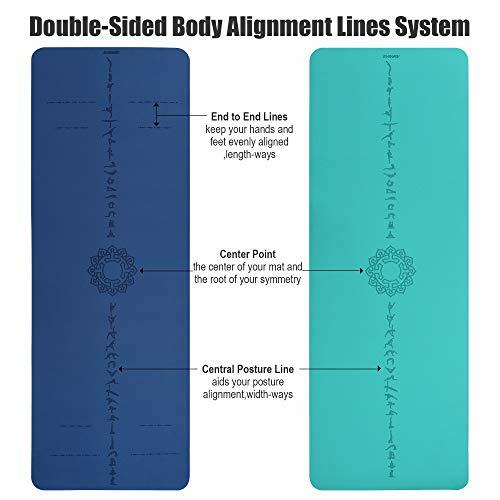 Safe yoga mat for men, women, girls, kids, etc BODY ALIGNMENT SYSTEM - professional yoga mat, help you focus and adjust your hands and feet to the accurate position, keep body in proper alignment. 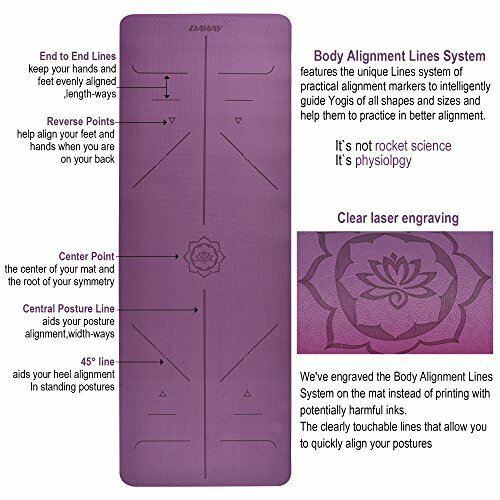 Warm tips: New yoga mat will have small smell, please wipe with a wet towel before the first use, then put it in cool and ventilated place 1-2 days, then smell will disappear DOUBLE SIDED NON-SLIP SURFACES, MOISTURE RESISTANT - special laser engraving texture make the exercise mat grip ground more firmly, prevent hands and feet from slipping out of position, prevent injuries. Moisture resistant feature makes the exercise mat easy to be washed with soap and water EXTRA LARGE SIZE, PROFESSIONAL THICKNESS, WITH CARRYING STRAP - 72" long 26" wide ensures comfort for everyone, 6 mm comfortable and supportive thickness, avoid knee and elbow pain, ideal for use on hard floors. Lightweight, easy to carry. 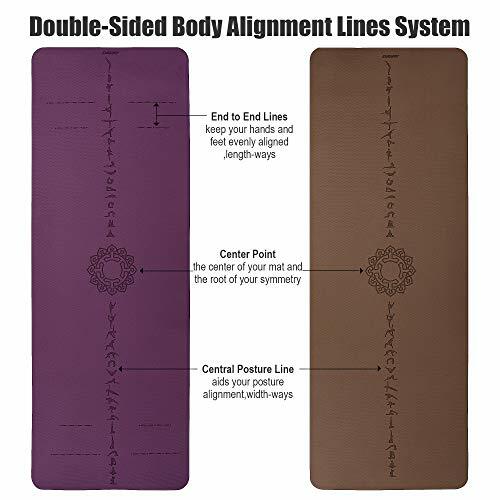 Variety of options, two-color fashion design, make you become the focus of the yoga studios, schools or fitness clubs DURABLE, MULTIFUNCTIONAL, QUALITY GUARANTEE - 1 year warranty, if you don't like our eco yoga mat or have any quality problems, pls email us, 100% refund or replace. Multiple uses, can also be used as a Pilates Mat, Exercise mat, Workout Mat or a Mat for Babies to Crawl On it. With DAWAY Y8 hot yoga mat you risk nothing.